Brilliant Lies - Book now! - Kapiti Playhouse Inc. Brilliant Lies – Book now! Kapiti Playhouse’s first production of the year, Brilliant Lies, opens on April 3rd and runs through to the 13th and bookings are open now! Tickets are: $20 Adults, $17 Seniors/Students, and $15 for Members. Bookings can be made at the Ticket Direct Information Desk in Coastlands Mall – Phone (04) 902 9885. 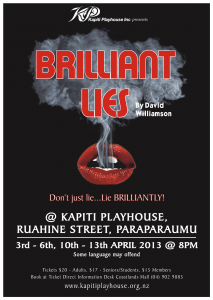 You can read more about the play on the Brilliant Lies page and over on the Kapiti Playhouse Facebook page.